UNICEF promotes the rights and well-being of every child in everything we do – including children living in Ireland. In 1992, the Government of Ireland ratified the United Nations Convention on the Rights of Child (UNCRC). 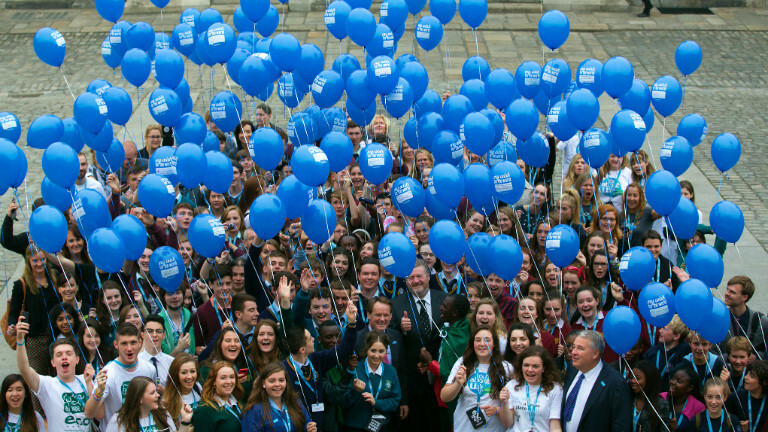 They committed to ensuring that every child in Ireland has access to their full rights. UNICEF Ireland holds the government to account on their commitment to implement the UNCRC, which is the world’s most widely ratified human rights treaty. By protecting and promoting the UNCRC, we aim to build a society where the rights of every child in Ireland are secured, guaranteeing them the opportunity to live a full, fair and healthy life. In order to advocate for the rights of children, we need to understand their daily realities. UNICEF Ireland engages with children and youth to understand their everyday experiences in their homes, schools and communities. Together we build a picture of the challenges they face. Children’s voices, choices and participation are critical for building a better future. Children and youth in Ireland speak out on their visions for the future – as their partners, our job is to empower them to achieve that. Children have a right to participate but UNICEF ensures that children are listened to by government, decision-makers and influences, the wider community and their peers. By bringing their issues to the attention of policy-makers, we strive to bring about the changes that children and youth want to see. If you want to get involved, and advocate for change so that we have a bright future follow us on Facebook, Twitter, and Instagram to see current projects, including Emergency Lessons, and U-Report.